How to sealing crawl space? There are several ways you can insulate or seal crawlspace openings. A crawlspace is an gap between the house and the ground. Crawlspaces allow workers access to electricity, plumbing, and heating systems. Crawlspaces can be a burden to a homeowner because they are often not properly sealed or insulated. That means you are inefficiently heating or cooling your home. Crawlspaces can also allow insects an easy access point of infestation. This article will show you how to seal crawlspaces, regardless of whether they are inside or outside or made from gravel or concrete. Before you can even think about using expanding spray foam to seal a gravel crawlspace, you need to locate any leaks. Locate the access point to the crawlspace. Examine closely both inside and outside for holes or other entrances. You may have to enter the crawlspace, so take a flashlight with you. Take special notice of pipes, tubing, and duct work. All of these things offer access for weather conditions as well as insects. Less obvious are the points in the crawlspace where wires are threaded. Even these little holes are an issue. Seal all of these areas with caulk, then further secure the area with expandable foam. Use the same technique on the outside of the home. Many crawlspaces have one or more doors that are usually flimsy. If you are lucky enough to have a thick door, use weatherstripping around the edges on both sides. If the door is old or flimsy, replace it with thicker wood or even metal. The doors are easy to build out of plywood and some hinges. 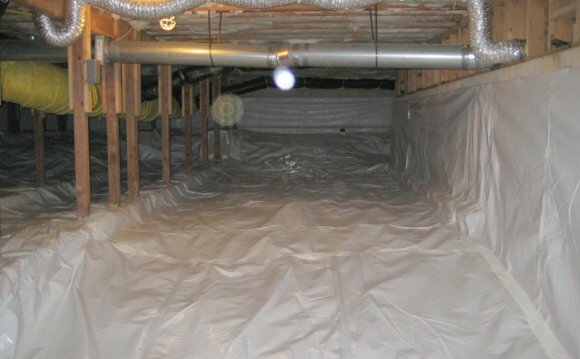 If your crawlspace is soil or gravel, a vapor barrier is a must. The plastic will protect the home from moisture, burrowing animals, and insects. It also reduces the chances of mold and mildew forming, since you are removing moisture and airflow. Drag your plastic sheet down to the crawlspace and unroll it. Make sure the entire floor of the crawlspace is covered. You can keep the plastic in place by using heavy rocks, bricks, or metal hooks. You can cut the plastic sheeting if you like, but it is not necessary. With the plastic sheeting in place, you can measure the space and cut the insulation to size. Cut the insulation in pieces. Assemble the pieces of insulation in the crawlspace to further insulate the space from the elements and insects.